For me the phrase 'must-win' is a bit like turning the amp up to 10, where do you go after that (a 'must must win')? There's still 15 league games to go and we're not safe yet and neither are Fulham doomed. That said, things look a hell of a lot rosier than they did a day ago, 3 more points and 10th place (at least until tonight) along with Shelvey, De Guzman, Pablo and Dyer returning. Where there was worries about the wheels coming off, in-fighting in the squad and questions about Laudrup 'not standing enough' there now comes two games against teams currently in the bottom three with the opportunity to get real breathing space before the return of the Europa League. It feels like crosses have been a weakness over the last few weeks especially. With the 'direct' football of West Ham, Cardiff and Stoke the next 3 games, minimising set pieces for the opposition will be key. 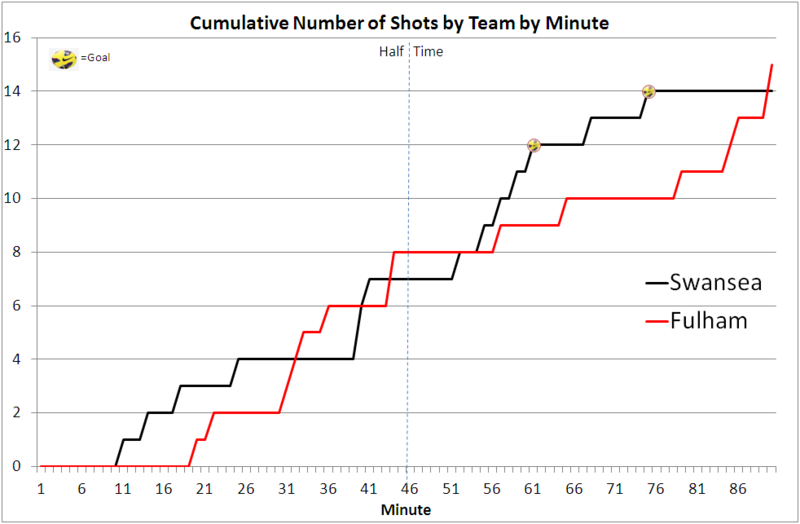 Overall, another relatively low key 1st half (22 of Swansea's 29 goals have been scored in the 2nd half), things were stepped up at the start of the 2nd. Despite the odd misplaced pass, I thought that this was one of Chico's better games for a while, not just because of the goal (which may like his effort against Sunderland get taken off him depending on the mood of the dubious goals panel) but his ability to break up Fulham attacks and willingness to move forward. Chico with most interceptions (7) of any player in the match, his more aggressive defending works well in tandem with Ash doing the clearing up when it goes wrong. It would have been fun if self-destructive to have seen him rather than Amat being given the role of emergency midfielder over the last couple of weeks although the worry would be that Chico would take that a licence to roam wherever he wanted.